Objectives: Cardiovascular disease (CVD) represents the leading cause of morbidity and mortality among patients with type 2 diabetes mellitus (T2DM). Its incidence and risk factor patterns vary widely across different diabetic populations. This study aims to assess the incidence and risk factor patterns of CVD events among Omanis with T2DM. Methods: A sample of 2 039 patients with T2DM from a primary care setting, who were free of CVD at beseline (2009−2010) were involved in a retrospective cohort study. Socio-demographic data and traditional risk factor assessments at the baseline were retrieved from medical records, after which the first CVD outcomes (coronary heart disease, stroke, and peripheral arterial disease) were traced from the baseline to December 2015, with a median follow-up period of 5.6 years. Results: The overall cumulative incidence of CVD was 9.4% with an incidence density of 17.6 per 1000 person-years. Prevalence of poor glycemic control, hypertension, obesity, dyslipidemia, albuminuria, and current smoking were 40.0%, 56.3%, 39.0%, 77.3%, 18.7%, and 7.8%, respectively. The univariate survival analysis showed a significant association between CVD and the following factors: age, diabetes duration, body mass index, glycemic control, hypertension, total serum cholesterol, and albuminuria. Conclusions: This study revealed high incidence of CVD and high prevalence of its traditional risk factors among Omanis with T2DM. In addition, compared to global studies, important differences in the prevalence of some risk factors and their patterns in the univariate association with the cardiovascular outcome have been observed. Keywords: Incidence; Risk Factors; Cardiovascular Disease; Coronary Heart Disease; Stroke; Type 2 Diabetes; Oman. Objectives: The prevalence of urolithiasis is increasing worldwide. Diabetes mellitus (DM) is characterized by insulin resistance, which increases the risk of kidney stone formation. Adiponectin is an insulin-sensitizing and anti-inflammatory cytokine, which is known to improve glucose tolerance and insulin resistance in humans. The association of insulin and adiponectin with kidney stones is not clear. Hence, the present study aim to assess the serum levels of adiponectin and insulin resistance in DM patients with urolithiasis in comparison to those without. Methods: This study involved two groups, group A consisted of 30 patients with DM and urolithiasis, and group B consisted of 30 patients with DM but without urolithiasis (control group). Biochemical parameters studied were serum adiponectin, insulin, glucose, urea, creatinine, and 24 hours urinary calcium and phosphate. Results: The serum adiponectin level was significantly increased in the diabetic urolithiasis cases (group A) compared to the control group (group B). The levels of 24 hours urine calcium and phosphorus were also significantly increased in group A. There was no significant difference in serum insulin and homeostasis model assessment of insulin resistance between the two groups. A negative correlation was seen between serum adiponectin and insulin among the cases (r = -0.368 and p = 0.045). Conclusions: We found that serum adiponectin levels are increased in patients with DM and urolithiasis. Adiponectin; Diabetes Mellitus; Insulin Resistance; Urolithiasis. Objectives: There is a widespread interest in exploring healthcare providers’ attitudes and perceptions about patient safety culture. This study was done to determine the reliability and validity of the Arabic version of Safety Attitude Questionnaire (SAQ) in Palestinian hospitals. Methods: This was a methodological study and the SAQ was translated into Arabic using the forward-backward translation technique. Four Ministry of Health hospitals in the Gaza Strip were randomly selected, and proportionate systematic sampling was followed to select the participants. Questionnaires were distributed to 370 physicians and nurses. Face and content validity were tested, and the content validity index was determined using the average approach. Internal consistency was assessed with Cronbach’s alpha, split-half reliability, and intercorrelation between the questionnaire scales. Construct validity was assessed through exploratory and confirmatory factor analysis. Results: A total of 339 questionnaires were received, giving a response rate of 91.6%. Questionnaire acceptability was good and relevant to the study purpose. Cronbach’s alpha value was 77.7 (74.7–82.2). Goodness of fit indices from the confirmatory factor analysis showed a satisfactory model fit: comparative fit of indices (CFI = 0.797), root mean square error of approximation (RMSEA = 0.085), and standardized root square residual (SRMR = 0.074). Factor analysis with varimax rotation revealed that six factors explained 62.3% of the variance. Conclusions: The Arabic version of SAQ (short form 2006) is valid and reliable, and shows a satisfactory model of fit. This instrument shows promise to be a sound tool to assess the safety culture in Palestinian hospitals. Reliability and Validity; Safety; Questionnaire; Safety Culture; Gaza Strip. Objectives: Injuries account for a substantial proportion of the burden of disease in adolescents globally. This paper describes injury rates and associated exposures, and risk behaviors in Oman’s 2010 Global School-based Student Health Survey (GSHS). 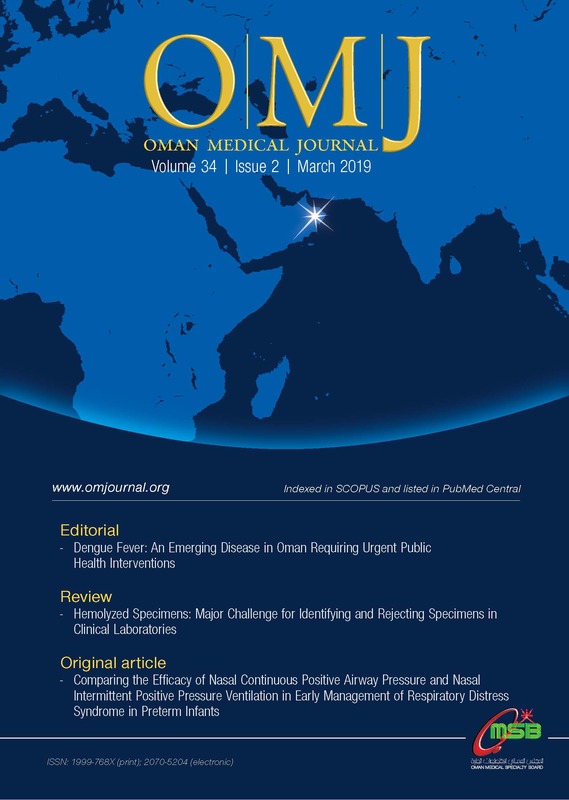 Methods: This study used complex samples analysis to examine nationally-representative data from 1 606 students in grades eight, nine, and 10 who participated in the 2010 Oman GSHS. Results: In total, 34.0% of the students reported having at least one injury in the past year that caused at least one full day abscence from usual activities or required medical treatment. The most common injury type reported was a broken bone or dislocated joint. The most common injury cause was falling. Additionally, 38.4% of the students reported being bullied in the past month, 38.8% reported being physically attacked in the past year, and 47.6% reported being in physical fights. Both injured boys and girls reported experiencing significantly more bullying, fights, and attacks (odds ratio > 2) than their non-injured classmates, even though only 9.6% of injured students reported that their most serious injury in the past year was the result of an assault, and students reporting assaults did not have significantly higher odds of exposure to these types of peer violence. More than half of the bullied students reported that the most frequent type of peer victimization they experienced was being made fun of with sexual jokes, comments, or gestures. Sexual bullying was the most common type of bullying reported by girls and boys. Conclusions: Promoting healthier peer relationships may help to reduce injuries in this age group as well as reducing the harmful effects of bullying. Wounds and Injuries; Violence; Bullying; Adolescents; Middle East. Objectives: Overweight and obesity are regarded as one of the most serious health and nutrition issues worldwide. This is immediately recognizable in both children and adolescents. In this study, we aimed to determine the effects of tailored education on lifestyle modification in elementary school students in Isfahan. Methods: In a quasi-experimental study, two elementary schools in Isfahan District 3, Iran, were randomly selected to determine the intervention and comparison groups. Subsequently, 32 students from each school, 64 in total, were chosen arbitrarily and included in the study. They filled out the standardized questionnaire of physical activity and dietary behaviors before the intervention. Following one and four months’ educational intervention, they were asked to complete the questionnaires once more. Results: The average general lifestyle score, one and four months after education, was significantly different between the groups (p < 0.001). However, this difference was not significant before the intervention (p = 0.660). Furthermore, the average lifestyle scores related to nutrition and physical activity one and four months after education showed a significant difference between the groups (p < 0.001). Conclusions: Providing overweight elementary school students with education about a healthy lifestyle improves their general lifestyle and reduces weight. Therefore, it is recommended that such interventions are applied to prevent complications associated with being overweight in children. Objectives: Quality of sleep (QoS) in individuals is affected by their occupation and is one of the factors affecting the quality of life (QoL). Few studies have evaluated the relationship between QoS and QoL in military women personnel. The aim of this study was to assess QoL and QoS, and compare their relationship among military and non-military women in Tehran. Methods: This cross-sectional study was carried out on 90 women working in Tehran during 2014, 30 were military forces, 30 were military staff, and 30 were civilian organizations staff. The female subjects were selected from Amin Police University and Tehran Health Insurance Organization using simple random sampling. The 36-Item Short Form Health Survey (SF-36) and Pittsburgh Sleep Quality Index (PSQI) were used to measure QoL and QoS, respectively. The relationship between QoL and QoS was assessed using Pearson’s correlation coefficient. Results: The mean scores of QoL in the military forces, military staff, and civilian organizations staff were 58.94±17.71, 67.18±13.52, and 69.10±12.51, respectively. Among the study participants, 62.9% of military forces, 20.0% of military staff, and 17.1% of the civilian organizations staff had poor QoS. Mental health as one of the dimensions of QoL was significantly different between military forces and civilian organizations staff. The association between QoL and QoS was statistically significant in military forces and military staff women. Conclusions: Low QoS and QoL in the army necessitates that the authorities offer programs and appropriate strategies to improve mental health of QoL and promotion of QoS. Quality of Life; Sleep Wake Disorders; Military Personnel; Women; Iran. Objectives: To identify the incidence, clinical characteristics, predisposing factors, morbidity, and mortality among hospitalized neonates with pneumothorax. Methods: The records of 2 204 infants admitted to the neonatal intensive care unit at King Fahad Medical City, Saudi Arabia, between 2011 and 2014 were reviewed. All newborns hospitalized in the neonatal intensive care unit with pneumothorax were included in the study. Participants were evaluated for baseline characteristics, predisposing factors of neonatal pneumothorax (NP), accompanying disorders, and mortality. Results: Pneumothorax was diagnosed in 86 patients, with an incidence of 3.9%. The most common predisposing factors of NP were bag mask ventilation, followed by hypoplastic lung disease, and mechanical ventilation. Twenty-five (29.1%) newborns with pneumothorax died. The most common accompanying disorder was premature rupture of membrane. On multivariate analysis, pulmonary hemorrhage, a birth weight < 2 500 g, and low Apgar score (< 7) at one minute were independently associated with mortality. Conclusions: This study highlights the extent of NP problems among hospitalized neonates and the most common predisposing factors of NP. Objectives: Pulmonary embolism (PE) is seven times more common in cancer patients than non-cancer patients. Since the existing clinical prediction rules (CPRs) were validated predominantly in a non-cancer population, we decided to look at the utility of arterial blood gas (ABG) analysis and D-dimer in predicting PE in cancer patients. Methods: Electronic medical records were reviewed between December 2005 and November 2010. A total of 177 computed tomography pulmonary angiograms (CTPAs) were performed. We selected 104 individuals based on completeness of laboratory and clinical data. Patients were divided into two groups, CTPA positive (patients with PE) and CTPA negative (PE excluded). Wells score, Geneva score, and modified Geneva score were calculated for each patient. Primary outcomes of interest were the sensitivities, specificities, positive, and negative predictive values for all three CPRs. Results: Of the total of 104 individuals who had CTPAs, 33 (31.7%) were positive for PE and 71 (68.3%) were negative. There was no difference in basic demographics between the two groups. Laboratory parameters were compared and partial pressure of oxygen was significantly lower in patients with PE (68.1 mmHg vs. 71 mmHg, p = 0.030). Clinical prediction rules showed good sensitivities (88−100%) and negative predictive values (93−100%). An alveolar-arterial (A-a) gradient > 20 had 100% sensitivity and negative predictive values. Conclusions: CPRs and a low A-a gradient were useful in excluding PE in cancer patients. There is a need for prospective trials to validate these results. The incidence of cesarean scar pregnancy (CSP), which was extremely rare till recent times, has been rising steadily. We have more of such cases being published in medical literature now. A 38-year-old woman with a past history of previous three cesarean sections presented with five weeks pregnancy and complaints of bleeding per vaginum associated with mild lower abdominal discomfort. The diagnosis of CSP with a live fetus within the gestational sac was made on a transvaginal ultrasound examination and later confirmed with a magnetic resonance imaging (MRI). The management involved injecting potassium chloride into the gestational sac and a combination of local and systemic methotrexate administration. The patient was followed-up by monitoring the beta human chorionic gonadotropin level until it reached non pregnant level and followed-up with scan and MRI until complete resolution of the pregnancy sac. Due to the rarity of this condition, there are no specific guidelines available for its management. Pregnancy, Ectopic; Methotrexate; Dilatation and Curettage; Laparoscopy. We report a case of Pseudomonas putida meningitis in a 26-year-old Nepalese man who was admitted to Hamad General Hospital with epidermoid cyst for drainage. Ommaya reservoir was placed into the cyst for drainage and externalventricular drainage (EVD) was performed. After four days, the patient was transferred to the ward in stable condition. His weakness resolved partially and headache severity decreased. After three days, the patient developed fever and headache severity increased with deterioration of consciousness level. Cerebrospinal fluid (CSF) through EVD showed 2 200 leucocytes/µL, protein level of 295 mg/dL, and glucose level of < 1.8 mg/dL. Meropenem was started on the patient. Aspirate from Ommaya reservoir and CSF showed gram-negative rods and cultures yielded P. putida sensitive to cefepime, gentamycin, ciprofloxacin, and amikacin, but resistant to meropenem and piperacillin-tazobactam. EVD was replaced and the patient received cefepime and ciprofloxacin for 21 days after which he improved and was discharged with right sided residual weakness. Nosocomial Infection; Community-Acquired Infection; Meningitis; Pseudomonas putida.